At Quattro Foods, the food development team at our Portsmouth factory are continually offering our customers the best support and ideas, so we can create delicious products such as ambient foods or fresh meals, perfect for the retail, food service and wholesaler sectors. We are a busy and passionate team who are not only creating new ideas for businesses and helping produce branded products, such as our sauces and pestos but we are also taste testing (hey, somebody has got to do it!) and ensuring that the food we produce is of the utmost quality. In 2010, we had nine members of staff in the Quattro team and we are happy to share that our steady growth means we employ approximately thirty permanent staff now, which continues to grow, especially as this month we welcome our new product development chef. Our chefs are trained and experienced in cuisines from across the globe, which means not only are they passionate about food and are great cooks but they are also highly skilled and it doesn’t end at just classical cuisine. They can create products for a variety of restaurants and wholesalers who offer different tastes for all. 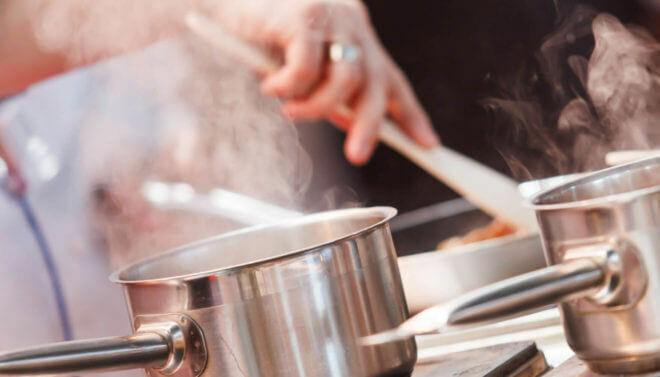 Our chefs can emulate any product that your business wishes to mass produce or they can start from scratch, offering new ideas on taste, texture and consistency and inventing the ideal products for your restaurant, café, pub or a wholesaler that are also at the right price point. Whether you want to create a seasonal soup that is tasty and affordable or you want to sell your own unique and ready-to-use sauce (RTU) in your restaurant or café, our chefs can make this process much easier for you as they work with your business to create a good, high-quality product that represents the essence of your brand. We pride ourselves on having a talented food development team, as it guarantees you can work with us in confidence, as we have the right skills to create something delicious that your customers will love. If you want to learn more about our team and how we can help create a food component or dish for your business, get in touch with Quattro Foods in Portsmouth and a member of our food development team will be happy to answer any enquiries. P.S. Follow us on Twitter, as we share the latest news from Quattro Foods and keep you updated in the food manufacturing sector.